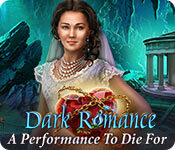 Dark Romance: A Performance to Die For is rated 4.0 out of 5 by 6. Rated 5 out of 5 by Majestyx12 from If you have talent he's going to get you! Christine and Raul want to marry. The problem is she has talent. Isaac is obsessed to collect talent. It's a ghostly tale in 1911. I just finished the main game and it's a long game. 6 Chapters. There is a lot of back and forth. I used the map a lot and had to use the gold small arrows. There are 13 main hops and a few small hops. The hops are quite girly and pretty, which I loved. This maker is known for their mini-games. Being a hops girl I was happy that I found plenty I liked. I liked playing the piano. Didn't like the fool with it puzzles though. It could of been better with zero skip instead of 15 sec. You can play match 3 instead of hops. I have all of the Dark Romance in CE. My favorites being Vampire in Love, The Swan Sonata and Winter Lily. Rated 5 out of 5 by biscuitsmama from BEWARE! 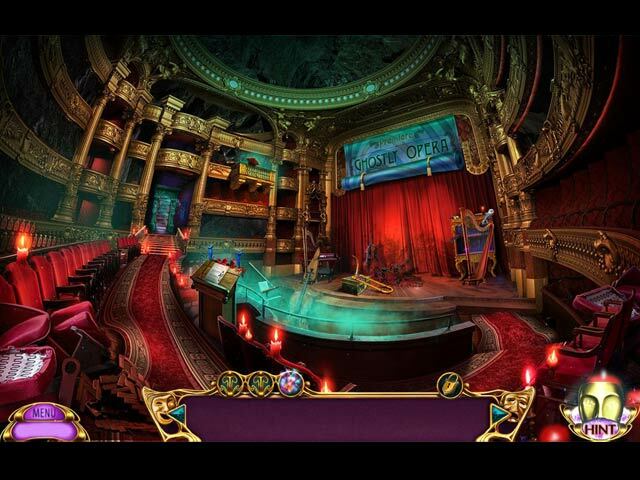 YOU MIGHT HAVE A LEAD ROLE IN THIS GHOSTLY OPERA Dark Romance A Performance to Die For, is the ninth game in the Dark Romance series and If the game seems familiar it is because it is loosely based on the novel by French author Gaston Leroux later to receive acclaim in the musical adaptation by Andrew Lloyd Webber – The Phantom of the Opera. 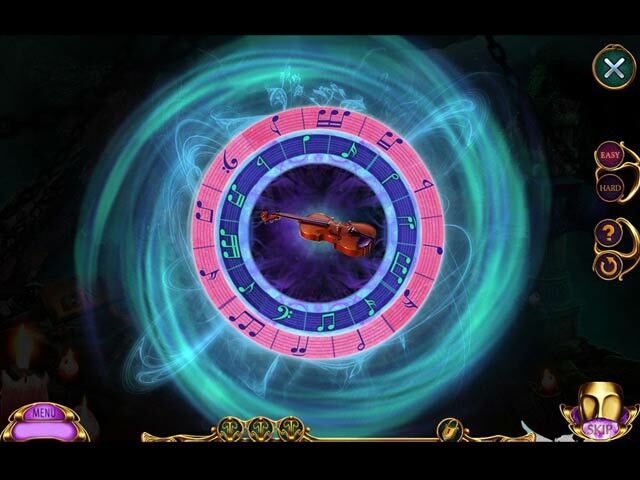 Because of my love of the musical play, I knew that this game would be a must have addition to my gaming library. I am happy to say that as I have played a good portion of the game that I am not disappointed. The game is as good as I thought and did exceed my expectations. As the game begins we see our heroine Christine as she is meeting with her beloved Raul shortly before a performance. Raul has just returned from a business trip abroad and as he promised he has a surprise for Christine. Shortly before Christine is to debut in a new opera, her beloved proposes to her. As he prepares to slip the ring on her finger, Christine is whisked away through a mirror by a strange masked man. Now Raul is left broken-hearted as he must save his beloved and get rid of the madman who kidnapped her. As in previous games in the Dark Romance series the lovers each take part in the game as we switch between characters, in this case Christine and Raul. Each character has their sequence where they move the game forward as they help each other. The game has all of the technical features we enjoy with a custom setting that has a couple of new features. The only issue I have with the custom setting, something I have noted before, is that the lower limit for the hint and skip settings should not be preset but that the gamer should be allowed to choose what the hint and skip limits should be according to how they like to play. Although there are some cute and not so cute critters in the game we do not have an animal helper. The HOPS are nothing that we haven’t seen before but still some are very creative and well-designed. For those of you who might not want to search for items to complete a HOP scene, there is an alternate match-e game available. The puzzles are entertaining but very easy. Even though we are given an option to choose between easy or hard when solving the puzzles, I happened to find even the hard option fairly easy. Although I enjoy puzzles in a HOP game, I don’t always want them to be brain-drain difficult so it was a nice change that I found most of them easily solvable. The game has 24 puzzles and 18 HOP scenes that can be replayed if you purchase the CE version of the game. In case you want to try the CE version of the game it includes the following extras: Collectibles to find that include Posters, 15 Theater Props, and Crystals to find and 36 Achievements to earn. Other extras include 10 Wallpapers, 10 Concept Artwork, 5 Music Tracks, Movies, and a Dressing Room that will be furnished by using the crystals you find in the game. The game includes a Bonus Chapter as well as a 55-Page Strategy Guide. Although I have found most of the Dark Romance games to be excellent, this one is my favorite in the series. Perhaps it is because of my infatuation with Phantom but also because of the graphics and the characters in the game. The gameplay was fun and yes I am happy to report that I wasn’t disappointed as we do find the glass knife and a myriad of other recognizable tools that we love to hate. I have said it many times that I am a game addict and I happen to enjoy most games that come along. Recently I have felt a bit disappointed but when I find a game from this developer I know it will have a lot of value in the way of activities, HO scenes and mini-games. There is not much more that I could ask for in a game. Although I love the game, please try the demo to see if it is right for you. Happy gaming! Rated 4 out of 5 by ninja226 from The phantom of the opera's ghostly troupe Love the gorgeous characters and interior scenes. Beautiful, beautiful, beautiful. 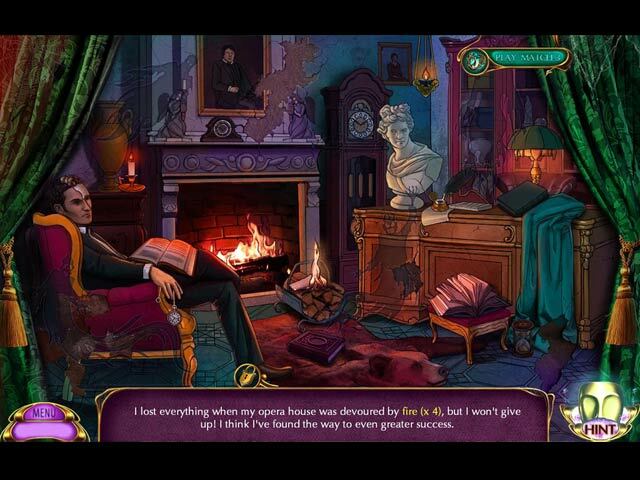 This is a long game with many puzzles and beautiful items to find in the HOPs. Can't say I liked all the puzzles, esp the ones where one action affects another and they were harder than they had to be. You have choice of hard & easy for puzzles and match 3 instead of HOP. Some actions to take are counter intuitive. Other than that, this is a fantastic game with lots of eye candy. Rated 2 out of 5 by PATinPNS from I Must Have Missed Something This is posted after playing the demo. I read the other reviews and I must have missed something in the demo, because I did not like this game one bit. I couldn't wait for the demo to end, which seemed like forever. One of the positives of this game were the graphics. They were colorful and pleasant on the eyes. Voice overs were very well done and the music and effects went along with the action in the scene. There are two offers of challenge in the mini games. I chose the easy, because I'm not a big fan of minis. I was able to complete most of them, but it got to the point I wanted this to end so I just started skipping. Hidden objects were very well done. Just enough difficulty to make them interesting. The story was okay. I never got into it and just didn't care for the characters at all. They seemed to be tossed into the story line as a last minute thought. I don't care much for this genre of game and perhaps that is the greatest problem I had with the story. It's a turn on Phantom of the Opera, mask and all, but Phantom was much better. Play the demo. Perhaps you will find this a better game than I.